At first glance, the R.C. Color Bug seems like a great idea and a fun product for young kids. 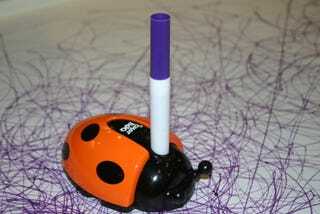 Plug a marker into the top of the remote-controlled bug, set it on a big sheet of paper and they can doodle away without having to stop bouncing off the walls long enough to sit down. But then it dawns on you that "art surfaces" can and probably will quickly grow to encompass your new white carpet, your leather sofa, and pretty much any other flat surface in your house. Luckily, it's not launching until September, giving you eight months to gird your loins and coat your entire house in vinyl. Also, given that they are likely to receive a patent on the entire concept "radio-controlled art," expect there to be many more of these things in the works. Official grade: Not for the faint of heart.